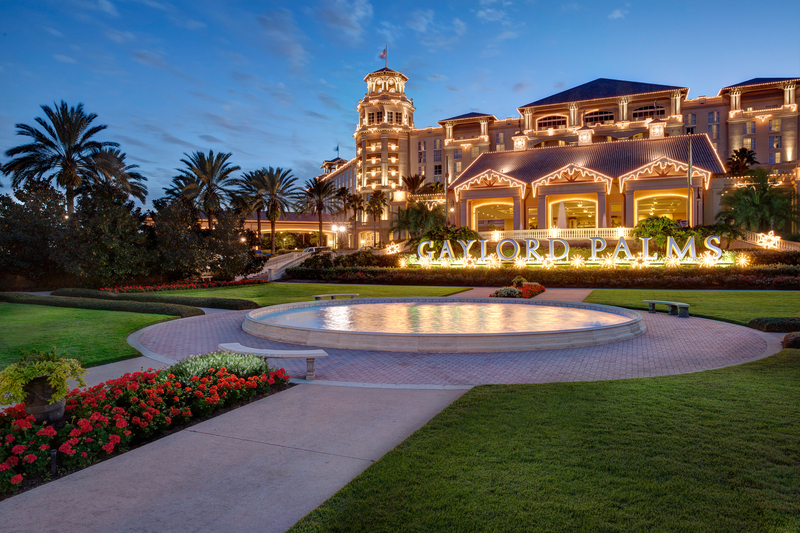 Gaylord Palms Resort is an oasis in the midst of busy Orlando, or nearby Kissimmee to be exact. Stroll along serpentine paths lined with giant ferns, cabbage palms, and verdant greenery. You’ll feel like you’re walking in a botanical garden, the Louisiana bayou or an island paradise; orchids, waterfalls, and streams — even a lake with a boat, fit inside the hotel atrium. The behemoth structure seems like a biosphere. Why, one could live within the confines for days and never need to go outside. 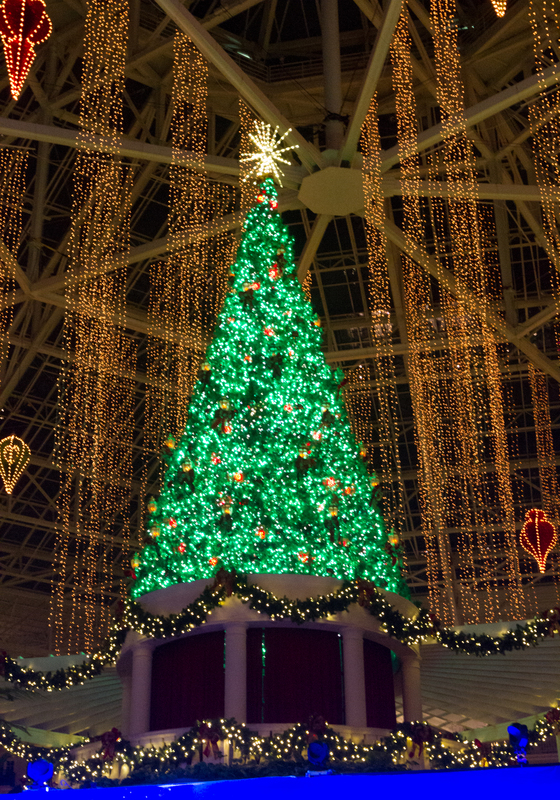 By Thanksgiving, the resort hotel adds holiday sparkle– over two million twinkling lights, beautiful bows and garland, plus thousands of poinsettia plants intermingled with the foliage. The expanse is gorgeous and the illuminated Christmas tree simply stunning. 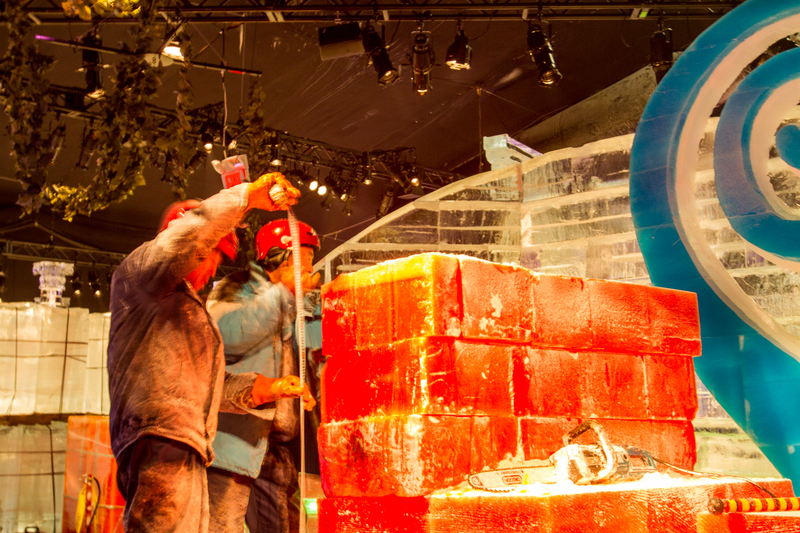 For the past twelve years, Gaylord Palms has turned their convention center into the “Florida Fridge.” The event begins to take shape in October, when 40 Chinese artisans and their cook arrive from Harbin, China. 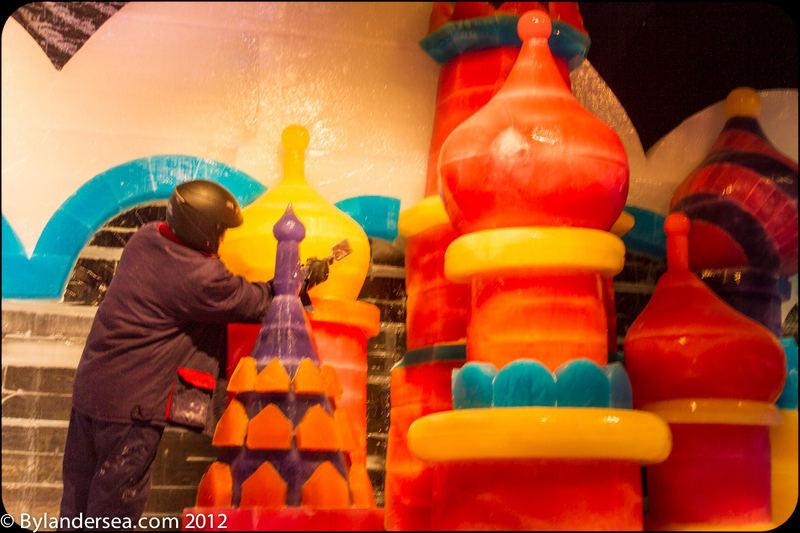 The ice men cometh to carve two million pounds of frozen water into a frosty fantasyland. The job takes approximately one month to complete. 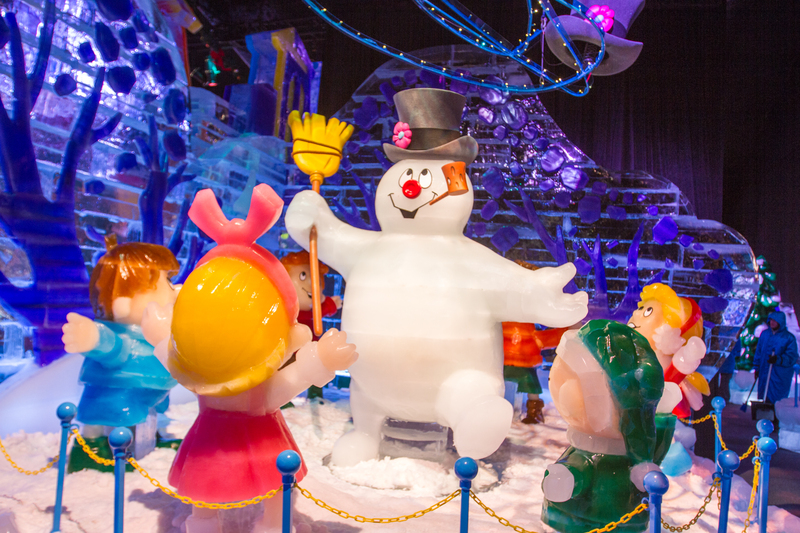 Frosty was the theme of ICE 2013. Originally, only crystal-clear ice was used, created by filtering de-ionized water for three days. Then, colored ice blocks were developed by adding food coloring. The process is not as easy as it sounds; the mixture must be stirred constantly to obtain consistent color. Making white ice is easiest, just freeze quickly for a cloudy look. The themed project starts with detailed architectural blueprints. Measurements are transferred and marked off on the floor. Like a home building site. Ice blocks start arriving from the factory at a rate of two truck loads a day for fifteen days. Each block weighs four hundred pounds, so they must be moved around by a forklift. Workers begin to assemble the blocks, adding special fluorescent lights between some of the pieces, and cutting others with chain saws. Sculptors denote points to guide them as they work like Michelangelo. Each artist brings his own set of tools, akin to a chef and his knives, including a variety of rakes, chisels, picks and trowels. The temperature in the room hovers around nine degrees, so carvers wear warm boots, coats, hats and gloves (You should, too, although Gaylord provides oversized parkas). They grapple through four-hour shifts with a warm-up break outside, but the Chinese are rugged. Harbin temperatures average only two degrees in the winter and sometimes plummet to -36F. No wonder these men enjoy Florida’s balmy weather. 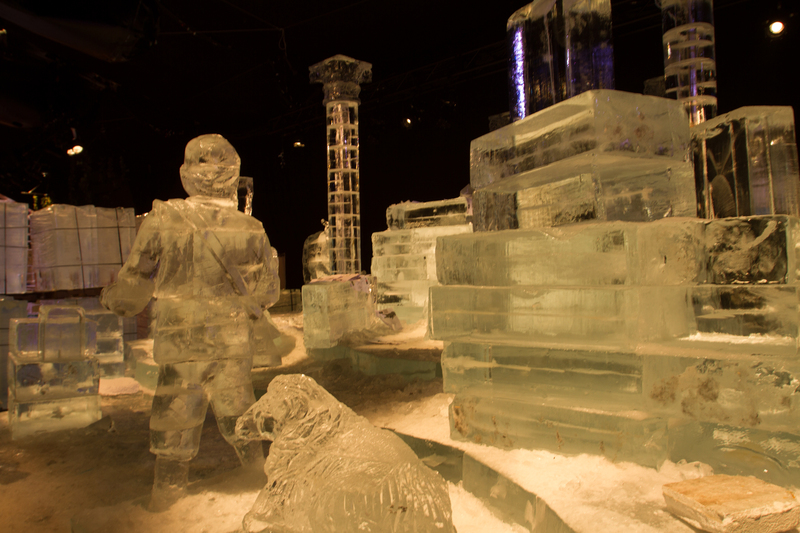 All scenes and characters are constructed entirely from ice, even popular interactive slides. No wooden supports or iron beams are used. The only scene to be repeated, since this event began, remains the magnificent life-size nativity, created from sparkling crystal-clear cubes. One artist, chosen by fellow sculptors, receives the honor of carving the largest angel. 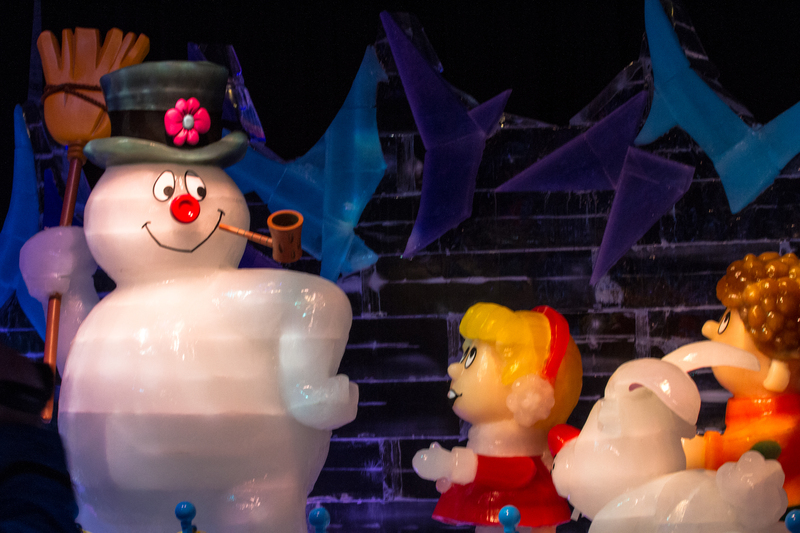 Visiting Gaylord Palms and ICE is a winter wonderland for Floridians, especially children. 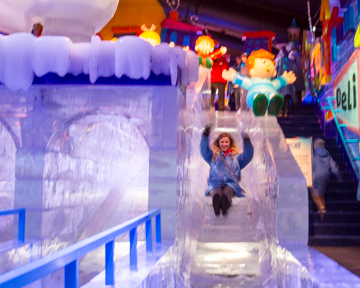 Kids love riding down the huge ice slides. This year, a new tubing hill will be added. The theme also changes yearly, and the 2014 holiday season is the Nutcracker. I have visited the attraction for the past four years, and every time I grow fonder. It’s just plain cool. When you’ve had enough of the cold (which doesn’t take long), get some hot cocoa, then head over to the gingerbread area and decorate a house or gingerbread man. At ICE, you get a pre-built house and a container with all sorts of candy adornments. Simply apply frosting as glue, and create your own masterpiece to take home. They play Christmas music, and people sing along as they work. 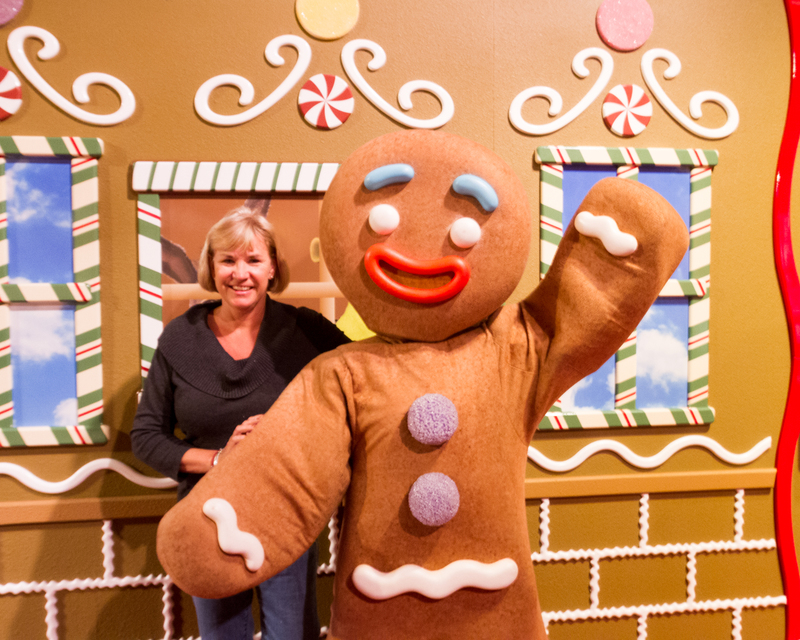 Gingy is one of my favorite characters from the Shrek movies, and he pops into the gingerbread decorating area from time to time. Of course, I needed a photo op! Stay around for Luminescence in the main hotel. It’s a musical and light spectacular, performed several times each day. 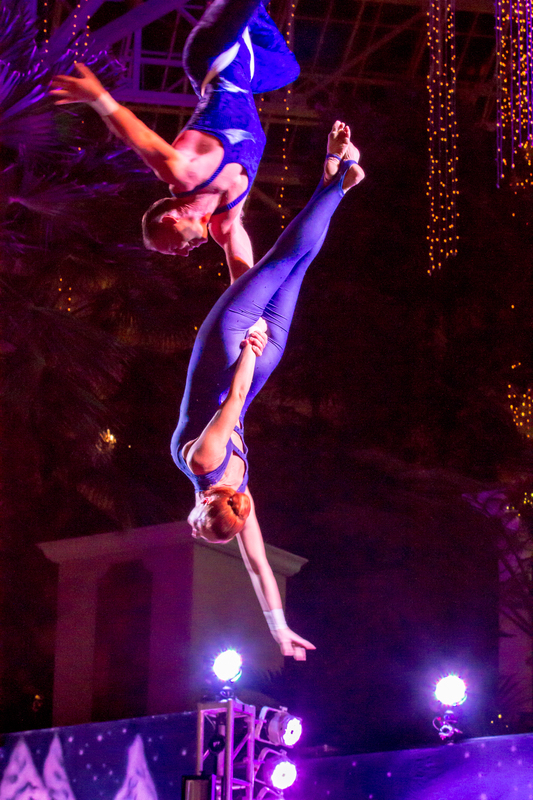 The presentation includes singers, stunning acrobatic routines and a drummer playing music while suspended over the stage. If you like Mannheim Steamroller type of music, you will love this show. Best of all, it’s free. Gaylord Palms also has a fabulous top of the line spa. I toured the facility and wanted to try the “Fire and Ice” facial, but unfortunately ran out of time. Guess I’m just going to have to return again! Other Gaylord properties (Grapevine, Texas; Nashville, Tennessee; and National Harbor near Washington, DC) also have ICE, but I’ve only visited the one in Florida. If you are looking for a holiday treat that will take your breath away, visit ICE or better yet, stay overnight and take in all that Gaylord properties have to offer.